We bring forth vast industrial experience and expertise in this business, instrumental in Wooden Skewer. 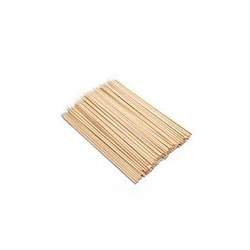 Wooden decorated skewers 4 " 6 " 8 "
8 Inch Bamboo Skewers, Size/Dimension: 8"
We have established ourselves as one of the most eminent entities involved in delivering Kebab Stick. Disposable Wooden Gun Stick 8", Size/Dimension: 8"
- 100% quantity, as declared.